For the bride to be that really is a princess! This pretty design is attractive and classy and is perfect for a genuine lady. You receive x1 gift bag with x1 printed sticker, provide us with your details and we print your personalised details on the sticker for you. You then simply peel and stick it onto the bag at home. With attractive hearts and ornate writing. Choose these personalised bags so that everybody knows who's the important lady of the night, and so they can all receive something to make them feel happy and relaxed. Remember you can fill it with anything, hen party accessories,games, toiletries, gifts or sweets. 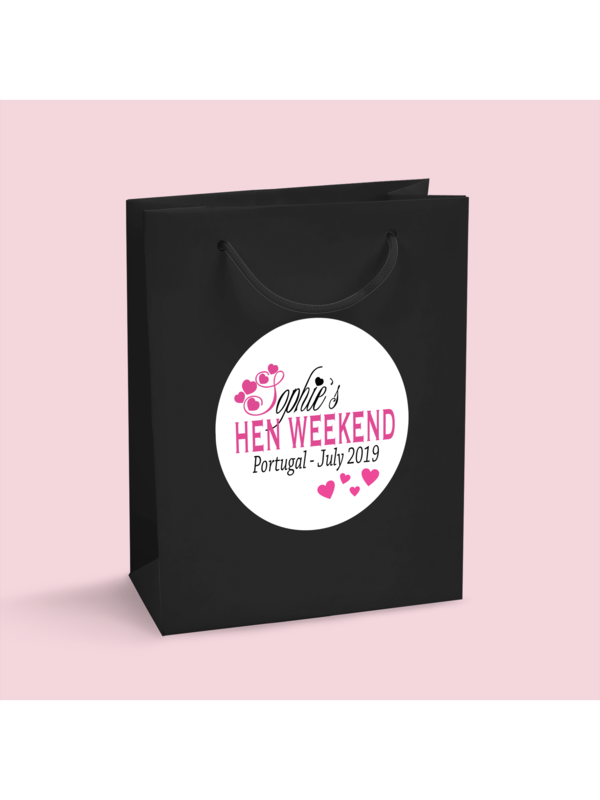 Showing our 8 Hen Party Superstore Pink Hearts Personalised Gloss Gift Bag reviews with an average rating of Excellent. Would you like to write a review? Lovely customer focused staff, fast delivery service and great products. Very impressed with entire service delivery from this company. We will order again soon. THANKS!! These boxes are so cute to make a little survival kit for the hen night and sturdy enough!! These are such a great thing to have as something little but fun added to the 'Hen Do' really liked. they were cute! Loved the bag and personalised stickers. Review Title - Fab bag! Review - The bags are a good quality - sturdy, and not cheap looking or feeling! - and the sticker came out really nicely. Everyone on the hen do was really impressed with the extra effort to have these bags made up! It was so simple to do these, and great value for money (obviously a bit more than a plain bag, but worth it for making that special effort) - I can highly recommend these! The bags are a good quality - sturdy, and not cheap looking or feeling! - and the sticker came out really nicely. Everyone on the hen do was really impressed with the extra effort to have these bags made up! It was so simple to do these, and great value for money (obviously a bit more than a plain bag, but worth it for making that special effort) - I can highly recommend these! Review Title - Amazing quality & price! Review - I'm very happy with these, being a maid of honour can be very expensive & you don;t want to compromise quality when trying to keep the cost down so these bags are lovely! I'm very happy with these, being a maid of honour can be very expensive & you don;t want to compromise quality when trying to keep the cost down so these bags are lovely!